The tension of my blood was unstable. It almost two weeks after my illness at home, there was no change. But still, I had a motivation to be back. The air felt different, not realize it was a clue. Late night, in one week to go to the end of Desember, 2015. 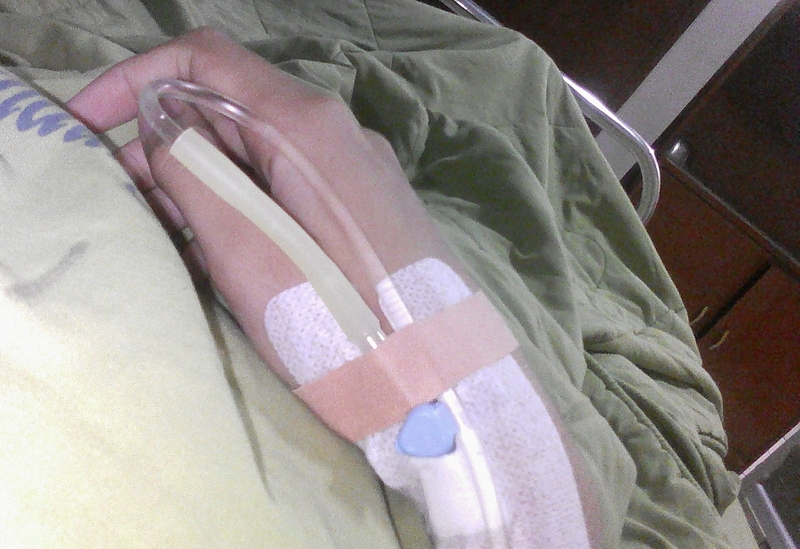 I was treated in Muhammadiyah Hospital, Bandung. Limp, even the needle on my hand could not be felt at all. Sometimes I saw my blood went forth through the hose of the infusion, horrible, but I could not do anything except calling the nurse to fix it. Thypus, never imagined would experience that way. The sweat always occurred in the night, and it was excessive, even it caused my clothes wet, and had to be changed. It happened when the temperature of fever turned down, twice a day. It was exhausting me, wanted to end it all. Sometimes, I also yet felt happy because it was my first experience to be in-patient. I wondered what it could be, and it was already happened then. Only one week, but felt like a month. I could not move right in, the doctor said my position on the bed must be straight, not allowed to move too much. My mom said, it was all caused by spicy foods. My brother said it was because my behavior, too exhausted and busy for doing my assignments of school. The patient room where I was in, seemed comfortable within its green bed, blanket, and pillow cover. There were some TV, a bathroom painted with soft brown color, and also a prayer room. Almost all of the walls painted with white color. I heard some general issue about food in the hospital, they usually unpalatable and caused the patient felt bored. On the other hand, this place was totally different. I found some menus such as, porridge with soya sauce fried chicken, soup, kinds of stir-fried vegetables, tofu, and different juices and fruits of each day. Many people who came to visit and check my condition wondered why. They wondered how I could eat them all without doubt. First, they thought it was not tasty at all. Second, probably there were rarely people that in an ill condition and still had a motivation to eat-well. The doctor said, if I was not eat-well, my condition would not be better, or probably the process of nursing would be longer than it was. The schedule of the serving menu in this hospital was done three times for each day, first for the breakfast, second for the lunch, and the last one was for the dinner. All I did in the hospital were just sleeping, watching TV, using phone, eating, drinking, brushing teeth, peeing, and defecating. I also sometimes prayed, it was hard to do because the infusion on my right hand made my movements hard to control. The prayer room was dirty on the first day I came. My family and friends who visited me always brought bread, cake, or fruit to give, yet I couldn’t eat bread at that time because the doctor said it was not allowed to be eaten because it had such a hard fiber and my intestine condition was unstable. So that, I had to eat something smooth such as porridge, juice, or soup. The visitors in the hospital, especially my family and friends were usually impressed with the condition of my room, it had such a complete facilities, seemed luxurious, roomy, and there were only two beds in one room, mine and the other. On the first until the third day, the other bed was empty, there was no other patient. I felt it was like a private room of mine, the visitors could also sit on that bed. My mom who always accompanied me in my room sometimes also slept there in the night. The difference of the first until the third day of hospitalized, and the fourth day till the end after another patient joined in was obviously could be seen. It felt free, the atmosphere of the room of the first till third day in-patient was cool, composed, and quiet. I could relax myself and built some motivation to be health as usual. It worked, the nurse said the enhancement of my condition was better everyday. In the following days, it was all suddenly changed. At the fourth day after, a new patient, a granny joined in my room, next to my bed. She always cried if she needed something, sometimes she had to be oxidized and it took approximately 15-minutes to do. Her visitors were also disturbed me, they slept on the floor and always chatting all the time. I could not watch TV as usual, and if I wanted to go to the bathroom, I have to queue. When I fell asleep, the granny sometimes screamed without any reasons. I could not take a bath by myself, so that the nurse asked me to dust me by a small towel and warm water on the bed. I complained it “Oh no! I am ashamed, I will not take off my clothes in front of them!” The nurses laughed and my mom told me it would be ok, because we were all females. The nurse said “Oh well it is ok, We will let your mom to do that”. This happened on the second day of hospitalized. Furthermore, because it was not enough to clean myself up. I decided to take a bath as usual in the bathroom everyday, even though it was not easy because I had to put my infusion wherever I go. The condition of the bathroom was neither clean nor dirty. When I had to wear my clothes by myself, the infusion sometimes made it difficult to wear. The strangeness of my room slowly changed. I felt it usual to live in this room, I had not gone out for one week being hospitalized. Imperceptible, in December 31st 2015. It had been 6 days for me being in-patient. The end of the year, for the first time, I was not at home yet. Could not even imagine would be there then. I heard fireworks exploding the sky and people screamed outside the hospital, so crowded. I wanted to go outside to see, so I walked down the floor and saw the luridness of the new year’s atmosphere through the window, I opened the curtain. It made me happier, even though the granny next on my bed still disturbed it with her whining. I fell asleep. The luridness went quite of the time approximately at 3 a.m. I was awake, I heard a girl screamed down the street “Help! Aaaaaaa. Help!”, some murmurs of several guys could be recognized, but I could not get the meaning. I was afraid of something bad probably happened there, but then I did not hear the continuity of that anymore. I told my mom in the morning, but she was not believed in it, she said it was ok, no need to figure it out though. I wondered what the time I would be allowed to go back home. So that, I asked my mom, and the doctor said it would be in January 2nd, 2016 at 1 p.m. I was so happy, screamed inside, eventually, I could see my environment and home again! Could not believe, yet I felt sad too because my room in the hospital taught me so many things. I learned about self-esteem, being patience, respecting people around, be grateful of what I had. At the end of the day being hospitalized, I took several pictures as a memory to be remembered before go back home. I took pictures of the washstand, bedcover, TV, windows, selfie, and all over the room. This was important for me, I used to take a picture of moment that I thought memorable and interesting in my life. There was something funny happened, I was afraid to put off the needle of the infusion on my hand because I saw my blood in it, in fact it was not even hurt at all. After that, I was accompanied by my mom and brother to get in car by chair wheel, it felt unique and strange, I finally could see the environment outside, breathing with the fresh air. The room in the hospital, a witness of my history in life, could not be forgotten ever. I was thankful to the Muhammadiyah Hospital, a place that had so many precious times for me, my life at the age of 17th, then and now.